The historian Alfred Young died yesterday at the age of 87. I first met Al through Herb Gutman during the American Social History Project’s first year. Herb dragged Steve Brier and me up to an unusually crowded session of the Columbia University Early American Seminar where Al presented his work on George Robert Twelves Hewes, the Boston shoemaker and participant of/witness to the Boston Massacre and Tea Party, the subject of his groundbreaking 1981 article in the William and Mary Quarterly (which he later expanded into his 2000 book The Shoemaker and the Tea Party: Memory and the American Revolution). That evening, Al delineated the artisans’ world in eighteenth-century Boston and the stakes for and impact on the city’s working people in their participation in making the Revolution—all offered with his intimate knowledge of their lives and, still so unusual among U.S. historians, his vast awareness of the visual culture of the time and acuity in locating their presence in the details and shards of the pictorial record. Out of that evening emerged one of our most cherished collaborations, with Al as primary advisor for our 1984 documentary Tea Party Etiquette. It was a very early ASHP effort, much of it composed of archival images uncovered by Al along with somewhat crude depictions of incidents in George Hewes’s life rendered by Kate Pfordresher and me (greatly enhanced by a sterling voice-over performance by the actor Victor Garber in the role of Hewes and music by the jazz saxophonist Jane Ira Bloom). Throughout its production, Al was an enthusiastic and imaginative collaborator, comfortable with the quirks of visual storytelling and creative in his thoughts about ways to transform academic prose into accessible dialogue. More than thirty years later Tea Party Etiquette is still one of our most sought-after programs. Al was one of ASHP’s godfathers, to whom we often turned for advice and support throughout the years. Or simply for the pleasure of seeing him. I recall in particular a visit with him to the Corcoran Gallery in 1990 during an Organization of American Historians annual meeting in Washington, D.C., to view the Facing History exhibit on the image of African Americans in the fine arts from 1710 to 1940: an unforgettable learning experience, with Al brilliantly illuminating both the works of art and the labels’ interpretations—what I wouldn’t give to have a recording of that visit! And, a few short years ago, ASHP benefited from Al’s largesse when, as he and his wife Marilyn prepared to move to Durham, he donated a large part of his stunning collection of revolutionary era exhibition catalogs and art history books to us. Generous, observant, gracious, it was always a lovely experience to be around Al. We learned so much from him and are so much the better for having known him. 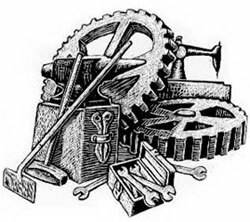 J. L. Bell at the estimable Boston 1775 blog has a wonderful tribute to Al here. Preparing for an upcoming teacher seminar, I came across a speech by Rep. Thaddeus Stevens introducing the 14th amendment to the Constitution to the U.S. House of Representatives. 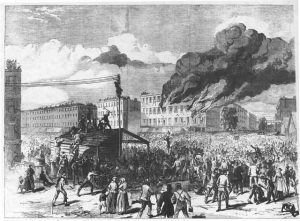 A graduate school professor of mine once noted that while Americans like to reenact military battles, no one ever seems to want to reenact Freedmen’s Bureau schools. In that spirit, I thought I’d honor the July 4th holiday* by sharing the part of the Stevens speech where he lays out the radicalism of section 1 of the fourteenth amendment. The first section prohibits the States from abridging the privileges and immunities of citizens of the United States, or unlawfully depriving them of life, liberty, or property, or of denying to any person within their jurisdiction the “equal” protection of the laws. I can hardly believe that any person can be found who will not admit that every one of these provisions is just. They are all asserted, in some form or other, in our DECLARATION or organic law. But the Constitution limits only the action of Congress, and is not a limitation on the States. This amendment supplies that defect, and allows Congress to correct the unjust legislation of the States, so far that the law which operates upon one man shall operate equally upon all. Whatever law punishes a white man for a crime shall punish the black man precisely in the same way and to the same degree. Whatever law protects the white man shall afford “equal” protection to the black man. 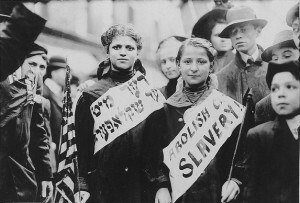 Jewish immigrants protest child labor, 1909. We sadly note the passing this week of our colleague and collaborator Liz Ewen. She wrote and co-wrote (often with her husband Stuart Ewen) great books of social and cultural history, including Channels of Desire: Mass Images and the Shaping of American Consciousness (1992), Picture Windows: How the Suburbs Happened (2000), Typecasting: On the Arts and Sciences of Human Inequality (2006), and Immigrant Women in the Land of Dollars: Life and Culture on the Lower East Side, 1890-1925 (1985). It was Immigrant Women in the Land of Dollars that inspired us to embark on our 1993 documentary Heaven Will Protect the Working Girl. In her book, Liz chronicled the experiences and captured the voices of Jewish and Italian working-class women in the turn of the century city, evoking a pivotal time and place while also powerfully evaluating the new perceptions, passions, pastimes, and activism those young women engendered. Not only were we inspired by that wonderful book, we then had the golden opportunity to work closely with Liz as one of our historical advisors. Funding wasn’t always dependable, so Heaven was one of our more attenuated projects—but that added up to more time to learn from Liz, who had an innate feel for the perfect illustrative anecdote and a tactile sense of what relationships of work, family, community, and love were like for young women living on the Lower East Side a century ago. And then there was always that warm, wry smile, and throaty laugh. It was lovely to know her, to work with her, and we—and her many students at SUNY, Old Westbury—are the better for it. Our project, Who Built America? 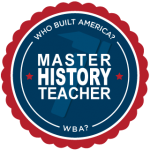 Badges for Teaching Disciplinary Literacy in History, beat out 14 other finalists to be the only winner in the competition’s Teacher Mastery & Feedback division, which was supported by the Bill & Melinda Gates Foundation. Working with Electric Funstuff (developer of the Mission: US online game) and Education Development Center/Center for Children and Technology (our longtime evaluation partners), the project takes ASHP/CML’s proven professional development methods and uses an online badge-earning system to build professional learning communities and promote social history and inquiry-based teaching methods. It also helps history teachers design instructional materials that will help their students meet the demands of the Common Core Standards. We expect the project to launch this fall, so drop us a line at enoonan at gc dot cuny dot edu if you’re a U.S. history teacher interested in participating.